Now you can control quality of video during Google Hangouts video chat session. Based on the internet connection speed of participating people in the video chat, you can customize bandwidth settings for best possible video and audio quality. If you high speed internet connection, HD webcam and computer with more processing power – you can even upgrade to high resolution HD video calls on Google Hangouts. 1. In your Google+ account, goto Home > Hangouts on Air option on sliding menu on left side. Then click Hangouts option at top right. Now click on Start a Party button on floating “Hangout Party” box at bottom right. 2. 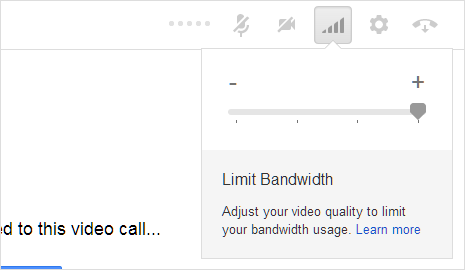 In the new window, click on the bandwidth icon at top right. Move the slider to + sign for more video quality, move it towards – sign to reduce video quality and bandwidth consumption. 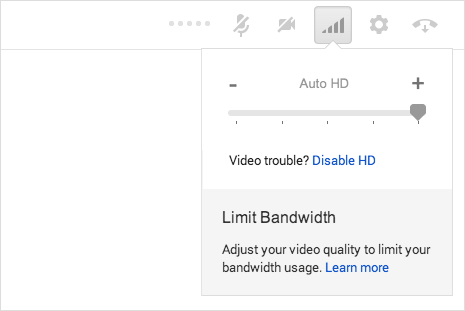 Auto HD appear in bandwidth settings screen to set maximum video quality as per availability. This require specific hardware and internet connection for HD video calls on Google Hangouts on Air. To send HD video, you require: HD 720p capable camera, computer CPU with least four logical cores (like i5 with HyperThreading) and internet connection with at least 1.2 Mbps or more upload speed. To receive HD video, you require: connection with at least a 1.2 Mbps download speed, monitor screen with at least 1440×900 pixels resolution and other person should able to send HD video (see send HD video requirements above). If you see auto HD option in the bandwidth setting screen, then you there is not much to configure. This implies that you are using best possible computer hardware and high speed internet connection. To get through with HD video quality Google Hangouts, make sure other person is also using similar or better configuration. If no auto HD option appears, you can move the slider to + sign for best possible video quality. Later if you have broken video or audio problem during video chat, you can adjust and reduce the bandwidth setting by moving the slider to left side to – sign and check for the issue.